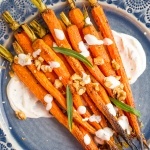 You know it’s spring when all the carrot recipes start to come out. So, let’s start things off with a lighter meal option, a delicious and stunning arugula and roasted carrot salad. This beautiful vegetarian salad is sure to impress – so if you want to see your friends with their jaws dropped, go ahead and try this recipe out! I mean, just look at this beauty!! Plus, the amazing combination of sour and sweet flavours doesn’t hurt! Sour lemon juice, sweet carrots, creamy goat cheese, and spicy arugula balance each other out perfectly. I also love that this roasted carrot salad looks super fancy but is so quick and easy to prepare. 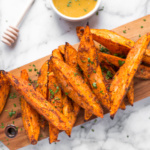 It’s also great way to use up any leftover garlic and herb roasted carrots! Or, if not using any leftovers, you can roast the carrots ahead of thyme time and then assemble the salad later. 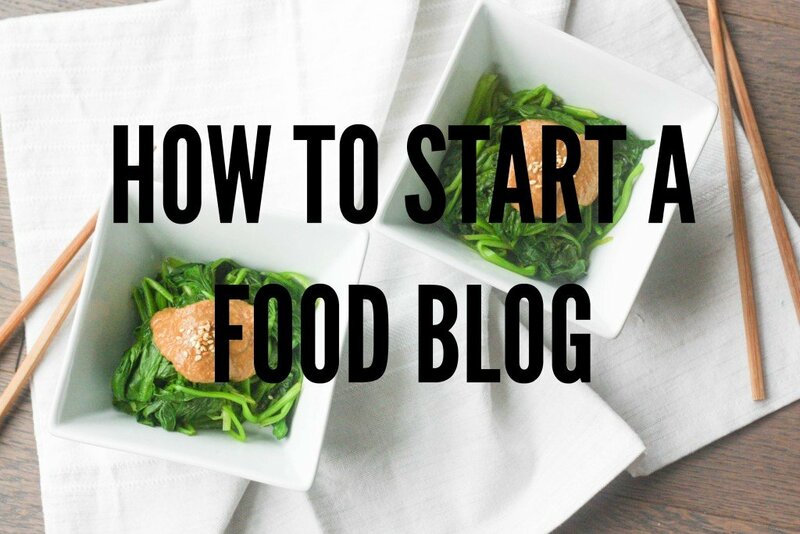 This will help you get your dinner on the table in no time. Simple. Easy. Classy. Yummy. Exactly how it should be. 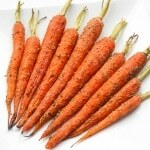 You can go versatile with the seasoning on your roasted carrots. Go wild and experiment with flavours. Try seasoning the carrots with garlic, chilli, cumin, thyme or dried sumac and roast until they’re fragrant and caramelized. Serve this salad pretty much any time of day. 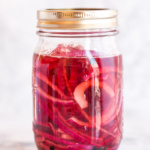 It works brilliantly as a starter for a relaxed dinner party or a light lunch with friends. I also like to serve some toasted baguettes alongside this hearty salad. 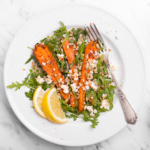 Delicious and stunning arugula and roasted carrot salad combines the delicious flavours of lemon juice, sweet carrots, creamy goat cheese, and spicy arugula. 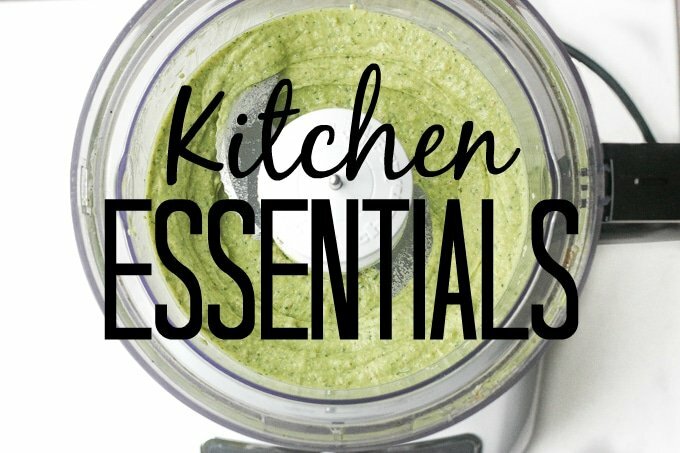 Plus, it’s so easy to prepare! Preheat the oven to 325 F (use a grill-function if you can). Place the carrots onto a baking sheet. Drizzle with olive oil and season with salt and pepper. Place in the oven. Roast (or grill) both sides for 5-6 minutes, or until golden. Remove from the heat and set aside to cool. To serve, divide the arugula leaves between two serving bowls. Add the carrots and top with the goat cheese. Drizzle with lemon juice and season to taste with salt and pepper. Top with toasted sunflower seeds. So simple! I’m on a bit of a carrot kick at the moment, so this is perfect timing! YUM. 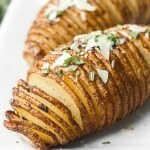 This looks so yummy, we are always looking for more ways to eat our veggies! I can’t wait to try it! That looks truly amazing and fresh. i look forward to trying this recipe.